Do You Need An Affordable Custom Fence In Crowley and Fort Worth, TX? 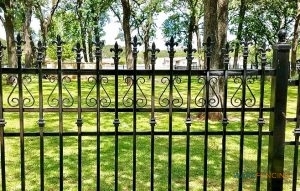 This Decorative Custom Fence is Made From Wrought Iron. Are you looking for a custom fence in Crowley and Fort Worth, TX and the surrounding areas? At Ware Fencing, we carry a wide variety of fencing styles and materials, and we are happy to accommodate custom orders as well. We have been fence professionals in the area for years, and because of this, we have extensive knowledge in almost every type of fencing. This allows us to create unique, durable, and impressive designs to your precise specifications. Give us a call today at 817-948-4503 to learn more about the services we offer, and let us help you choose the ideal fence for your home! Installing a fence is a large investment and one that you’ll want to be perfect. From the first call you make to our experts, you’ll have a team of dedicated professionals at your disposal. We work with you every step of the way to ensure you get the ideal fence for your needs, style, and budget. To begin, we will ask the purpose of your fence. Are you looking for additional security, containment for kids or pets, or perhaps just an accent for your property? From there, we can discuss your budget and material options. Some materials can work together for spectacular custom fences that are as practical as they are impressive. For example, a common custom fence method is stone or brick columns supporting a wrought iron fence. This works well, considering the low maintenance requirements of those fencing materials. Some clients even utilize cedar fence boards with wrought iron, for a rustic, durable aesthetic. This Custom Fence is Made With Cedar and Iron. Custom fences are a great way to add a unique component to your property, as well as additional security and property value. At Ware Fencing, our fence installers perform each fence installation with high-quality materials, and diligent craftsmanship. If you’ve been waiting to find your perfect fence, consider creating it instead. Our professionals are ready to help your vision become a reality. Whenever you need a custom fence in Crowley and Fort Worth, TX or the surrounding areas, we are the contractors you can count on. We specialize in fence repair and fence replacement, and we look forward to serving you! Call today at 817-948-4503 to begin!